“When dusk arrives in the city of Manila, that’s when you become the most likely prey of the criminal underworld. The second volume in the Trese series, Unreported Murders delves deeper into the world of the paranormal, much to my delight and horror. I have revived my old high school habit of reading during the thin sliver of time between studying and sleeping, and reading about monsters that could probably be a-creepin’ around my room at the moment doesn’t really help in the sleeping part. Nevertheless, I was able to revel more in the interesting aspect of this volume rather than the scare factor, which leads me to mention my thoughts after finishing the last case. There are four cases featured in Unreported Murders. I was very much amused to find so many references to things that exist in our collective consciousness, parodies of well-known people and places, and urban legends that get passed on from generation to generation. Exhibit A: In A Little Known Murder in Studio 4, ABC-ZNN sounds very much like ABS-CBN, a real-life Philippine TV network that is presently located along Mother Ignacia Street, and Heather Evangelista, the victim, clearly references Heart Evangelista. Exhibit B: Embrace of the Unwanted. This case clearly plays on the infamous Robinsons malls urban legend about a snake that kidnaps and eats women in dressing rooms. There are much more, and finding these Easter eggs definitely adds to the fun of reading this volume, and every volume in the Trese series. So far, this is the more graphic of the first two Trese books. Because one of the cases involves zombies, and another involves a horde of the creatures, there are naturally more fight scenes between the monsters and Alexandra with her kambal. If you enjoy that sort of thing, you will definitely enjoy this volume. I still like the first book more, but this volume doesn’t trail too far behind. I liked Unreported Murders, and it’s doing a really good job of keeping the next books hyped up and keeping my interest. There are still things about Alexandra Trese and the other characters that I wished to be explored ever since the first book, but since this is part of a series, I am not without hope that the next book will explain the mystery of their identities. “When the sun sets in the city of Manila, don’t you dare make a wrong turn and end up in that dimly-lit side of the metro, where aswang run the most-wanted kidnapping rings, where kapre are the kingpins of crime, and engkantos slip through the cracks and steal your most precious possessions. I first heard of Trese sometime around December of last year, but as I was busy with college-related stuff, I didn’t think much of it and eventually forgot about it… until my parents gave me gift certificates to National Bookstore for Christmas and I was free to FINALLY buy books! I spent the last of them on this whole series, a decision which, so far, I DO NOT REGRET. Before I even started reading the graphic novels, I was already very excited. 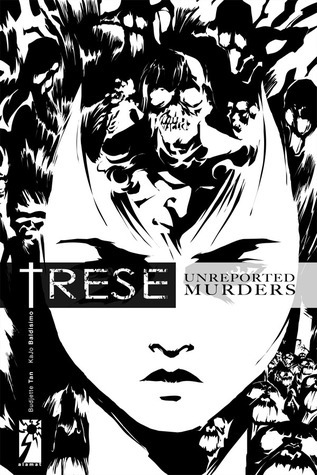 I love stories that have mythological aspects in a modern setting, and Trese promises to deliver just that. Filipino readers will be delighted to find the legendary aswang, kapre, engkantos, and several other creatures from native folklore jump straight from the page with the sharp angles of the black-and-white illustrations and dialogue that reveal their true selves as well as the side that allows them to mingle among us, unnoticed. 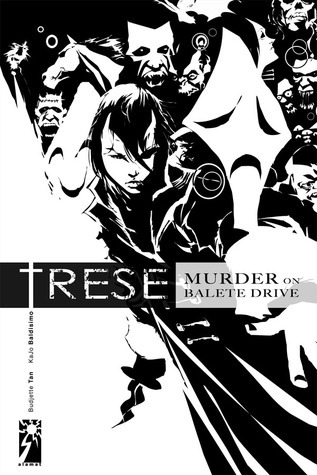 Trese: Murder on Balete Drive is the first book in the Trese series written by Budjette Tan and illustrated by KaJo Baldisimo. It has four cases that the protagonist, a bold young woman named Alexandra Trese, tackles with her trusty kambal bodyguards. The settings are eerily familiar, based on real roads and places within the Philippines. Case 2, Rules of the Race, stands out clearly in my mind, because the main storyline takes place in C-5, a road I pass every day to and from school. That, and the familiarity of the folklore and horror stories I grew up with as a child made reading this more interesting. I normally don’t read supernatural stuff, and I was initially trepidated at the prospect of reading about the things that lurked around my childhood nightmares living among us now. I thought that if I read about the aswang actually surviving in the hustle and bustle of the metropolis, the forever young side of my brain will freak out and think I am no longer safe. That was not the case with this book, and with that I am glad. It’s not because the material wasn’t convincing; I was just really interested. And because of that, I am now all the more excited to read the coming books. I really suggest everyone to take up this series and read it, but I’m afraid those unfamiliar with Philippine mythology could feel a bit lost. That said, if you read Trese, you would be able to get some information about the creatures from the stories, but if there are a lot of sources in the Internet that cover them. I was Googling “Philippine monsters” and I saw this. I am Filipino and I haven’t even heard of some of the monsters, there are so many of them. Now that I’ve read the first volume, I really must start reading the next ones!